We would love to have you visit our secluded riverfront home in the heart of Mount Washington Valley. “Lost on the River” is a slice of heaven on the east branch of the Saco River. Situated on the end of a private road less than 10 minutes to North Conway, this is a wonderful “out of the way location, close to everything” in the middle of all the White Mountains have to offer – hiking, golf, Storyland, outlet shopping, skiing, snowmobiling, fly fishing or taking a refreshing dip in the river in front our house. This area is also home to some of the best motorcycle riding in all of New England. Our cabin is perfect for couples and small families who enjoy the tranquility of a remote riverfront location yet appreciate the amenities of a fully functional house. It is clean and comfortable with many ‘little extras” – fireplace, full kitchen, washer/dryer, HDTV, DVD, Free WiFi, free telephone, stereo, gas grill, as well as a riverfront fire pit. Your dog is welcome with prior approval and an additional $15/night pet fee. Summer and Fall: Start off your day with breakfast on the front porch overlooking the riverfront, pack a lunch and hike around nearby Mountain pond, come back and relax by the fire pit on the river, and then fall to sleep with the sound of the river outside your bedroom window…..
We live on Cape Cod and met about 14 years ago. We were married at this property in 2010. In 2011 we became custodial grandparents to 2 beautiful girls (9 & 14), and now do not have the opportunity to visit as often as we used to..... So we have decided to share our property with others who will appreciate the very special location. We knew we wanted to buy in the North Conway area, and had been looking at a lot of 'cookie cutter' houses.... Our 1st priority was location - even if we had to build. When the realtor drove us up to this house, we both knew the second we stepped out of the car we had found what we were looking for!! And the fact that we had a fully functioning house was a dream come true!!! We are sure that you will feel the same!! Cabin was clean, well-kept, and well-stocked with firewood for the woodstove. Would highly recommend. Absolutely loved the location. Can hear the river running over the rocks across the road. Last house on a dead end. Very secluded and peaceful. My stay was in the still very snowy early spring. The functioning fireplace was a real treat. I'll be going back. This is a great spot if you want to get away from the hustle of everyday life. It was winter with snow piled up on my visit but you could see the river beginning to open up over the snow banks. Brenda was in contact the day of my arrival to make sure all went well, and it did. Brenda’s cabin is a little piece of heaven on the river! We loved the quiet, homey feel of the cabin. Would highly, highly recommend! Location is tucked away, but very close to so many restaurants, attractions and trails. This spot is amazing! Directly across from a beautiful river, with a trail to hike right next door. The cabin was clean, and adorable. We cant wait to visit again this summer!!! 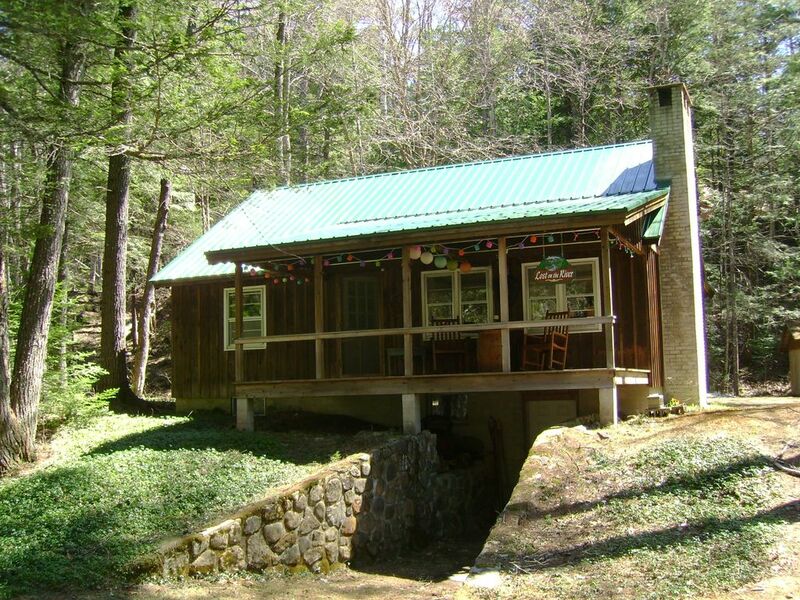 This cabin was excellent for us, property owner,Brenda was very helpful before and after our stay there. We enjoy comfy and cleanliness of cabin. We enjoyed been by the fireplace in the woods. Looking forward to stay there again. If you’re looking to relax this the place. Thanks so much Brenda. We are avid motorcyclists - so ask us for some suggested routes.